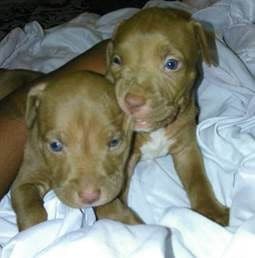 The D.C. police are looking for the public’s help in finding two pit bull puppies and the man who they say stole them. WASHINGTON — D.C. police are looking for the public’s help in finding two pit bull puppies and the man who they say stole them. The police said in a statement Monday that a woman was walking her two puppies Sunday at around noon on Southern Avenue in Southeast D.C., on the Maryland line, when a man walked up to her, showed her a handgun and demanded the dogs. 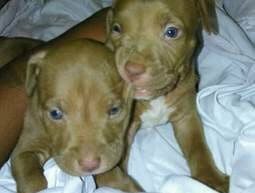 He left with the puppies and headed toward Heath Street, in Capitol Heights, Maryland. The man is considered armed and dangerous and is described as black, 20–30 years old and about 5 feet 5 inches tall, with a dark complexion, skinny build and short hair. He was last seen wearing a black puffy coat, black knit cap and black sweatpants. The puppies are tan and about 2 months old. One has a black collar; the other, a blue collar.